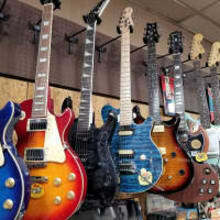 Staff Music is a family owned music store located in Akron, Ohio. Run by a father and son with over 100 years combined experience in playing, building, repairing and selling instruments. Serving Ohio and the surrounding area since 1964. Low prices, super service, great selection. Unique, not your typical music store. Buy, Sell, Trade, Consign, Lessons, Repairs - New and Used - Guitars, Amps, Drums, PA, Accessories. Although we've been in business since 1964, we're just getting started with Reverb. We are in the middle of a digital upgrade [website, social media, etc.] so bear with us as we try to fill up our Reverb shop and jump head first into the digital age. Hopefully, you CAN teach an old dog new tricks! Thanks for stopping by and please don't hesitate to contact us with any questions about the shop or any of the items listed. For items available to ship, and not listed as local pickup only, buyers will be charged according to current rates. We usually ship via UPS Ground or USPS depending on rate, size, etc.. All items will include insurance as part of the shipping cost. Communication is the key so please call or message with any questions, concerns or needs. NOTE: Shipping costs reflect fees to the furthest U.S. destination from us. Exact shipping costs can be provided (and updated) once your destination zip code is provided. No returns on "Local Pickup" items. Items to be inspected and tested upon pickup. Feel free to contact us with any questions or concerns.